I love my goddess skirt, not least because I found it at one of my favorite NYC thrift shops, Housing Works. The skirt is so fab, when I went to pay for it, the cashier eyeballed me like she was going to duke it out. I prevailed. The velvet skirt is by Vivienne Tam (same). It’s one of those feel-good pieces – you have them, right? I stand taller when I’m wearing it. The print scarf by Christian Audigier (thrifted, sim) doesn’t match, but it goes, somehow. The thrifted black shirt is by Theory (sim) and the boots (sim) are thrifted too. I just realized, I’m thrifty head to toe. The fabulous necklace was created by my friend, Suzanne Carillo. Wow, i love the print on this skirt Patti, it looks lovely on you and I would love to join you thrifting if I could . You look lovely! Such unique pattern mixing and I love the fun pops of color. Wish I could wear bare legs right about now. No chance here in Illinois! You look fab! Love the prints on that skirt and scarf! beautiful ! So groovy, Patti. You go, alright, the skirt, the scarf, everything. Way out, man. I adore that skirt – I have a Vivienne Tam skirt as well, and it’s the nicest quality. Looking fabulous from head to toe, Patti! That is a truly fabulous and unique skirt Patti…love it! Oh how I love colorful prints! That skirt and scarf are some fab finds. And Susan’s necklace looks great with that outfit. The black shirt is the perfect canvas to showcase all those unique pieces. Patti…you look so hip in this ensemble. No, the scarf is not matchy-matchy to your skirt, but they look fabulous together! And your boots…totally cool! It is cool enough in Florida to wear them now, yes? 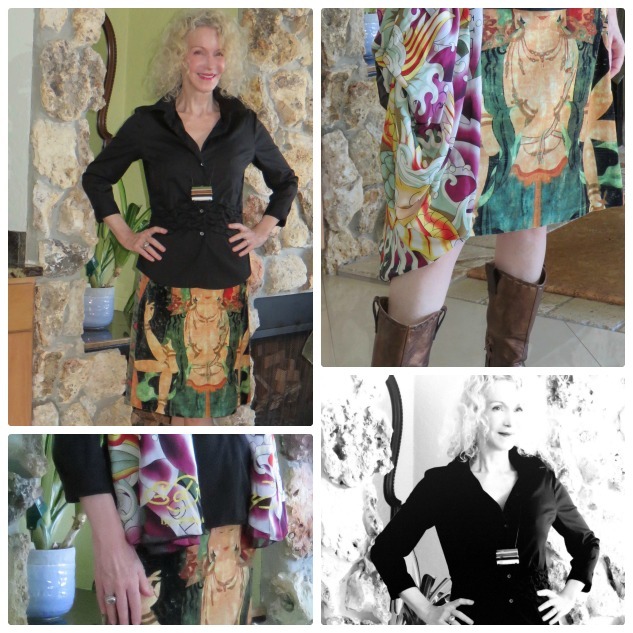 Yes, the scarf does go with the skirt – so many bright, swirling colors. Fabulous! They’re all great finds, from the boots to the top. Fit for your own goddess-self! I adore the pattern on pattern you’ve got going on here. That skirt was such a find. I LOVE that Vivienne Tam skirt!!!! Fabulous. Thank you for hosting. Now that’s one badass skirt!!! LOVE the prints on both the skirt and the scarf! the colours are really flattering and it reminds me of a good painting…makes you just want to stare at it for a while. Loving the mixed prints!! Gorgeous. love print of your skirt!! I can’t get over how awesome that skirt is esp with black – Have a lovely week!! Beautiful pieces – both the skirt and the scarf. I love such types of interesting prints too. Dear patti I always go soft in the knees with skirts, and yours is beyond lovely. Thank you so much for this meeting. The skirt is fantastic – what a lucky find! I like that you paired it with a black blouse to show the skirt in its full glory. Fun necklace too – so very you, Patti! Your goddess skirt certainly is one special skirt, no wonder it came home. Perfectly matched with your scarf, shirt and boots. You epitomise the joys of thrifting. You are so right, this is such a good skirt. Great idea to pair it with those boots. You know how much I like such boots. And a shirt by Theory is a lifetime keeper too. Looking good dear. It is no 6.15 a.m. and I made it to Visible Monday. I absolutely love the pairing of the scarf with your Goddess skirt. They work wonderfully together even though the two prints are different the color palette is the same and you were wise enough to ground them with your beautiful black sweater. Lovely outfit. I knew right when I saw your necklace that it just had to be one of our dear friends, Suzanne’s creations, it a magificent piece of art. That skirt and your scarf are two gorgeous art pieces Patti. Love them both so much. You are a vision of color, style and beauty today! You rule. The skirt is fabulous as is the rest of the outfit. That skirt is amazing. And one of the reasons I love thrift stores; they can yield such unique finds. And your find is unique and gorgeous! Print skirts are a blast to find, wear and cherish. Thanking you for being the linkup hostess with the mostest. A goddess skirt for a goddess – a perfect match! Love the prints and colours, Patti, you look fabulous. Everyone needs those go-to pieces that make us feel great, without fail! I absolutely LOVE that goddess skirt! What a find! Gorgeous colors and prints, Patti. Such a vibrant, fun skirt…just like you, not to mention: gorgeous!!! We can’t have too many of those feel good pieces. And they’re so hard to come by that you better grab them you see them. It’s a beautiful skirt, you’re really good at trifting!